As Tonga Football Association (TFA) strives to bring football to as many Tongans as possible, the occasion was marked with the presence of the Australian High Commissioner to Tonga, His Excellency, Mr. Thomas Roth, his Third Secretary/ Vice Consul, Eliza Woolcock, Minister of Training, Employment and Sports, Honourable Feao Vakata and Punjas (Tonga) Ltd manager, Mr. Abdul Shamim who have been supporting the children’s program since Tonga first piloted Just Play in late 2009. The sounds of laughter and cheers echoing, and more importantly the expression on the children’s faces says it all, in a day that wraps up what has been a six months tournament that started off with 40 teams, a record itself for any local tournaments. 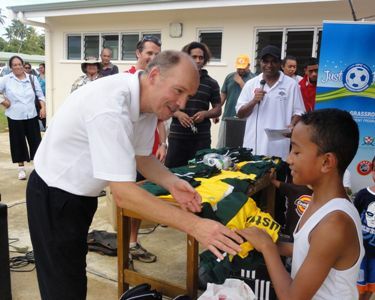 The office of the High Commission in Tonga sponsored prizes for the U-12 division to the tune of TOP$2,000, which includes uniform sets in Australian colours, which undoubtedly will be the winning teams uniform in the upcoming season. The Guest of Honour, H.E Mr. Thomas Roth said that the Australian High Commission is delighted to be present to witness the finals of the Just Play competition, a grassroots program funded by the Australian Government to encourage active and healthy lifestyle at a very young age. He said the gifts are an expression of friendship between the two countries. The excitement and the enjoinment was enough to get the high commissioner on the pitch for a game with the kids. 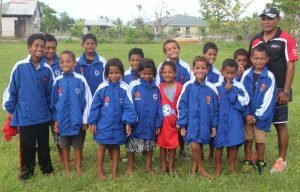 In addressing the Just Play family in Tonga, the Honourable Minister of Sports said his is encouraged by the work TFA in partnership with Oceania Football Confederation has done at the primary school level, he added that the football authority in the kingdom have been thriving since its establishment in the 1970’s and now football has become a national sport. He also went on to reveal his plans for the country. “I am embarking on setting up a Tonga Institute of Sport to focus on running programs for schools and the communities. To train our best young athletes and collaborate with other sporting bodies to provide the best possible service to all athletes in terms of training and performance.” Vakata said. A sentiment that reflects Just Play’s philosophy. The U12 Division was won by Vain A who thrashed Vaololoa 8-1, while Vaini B beat Longoteme 2-0 to take the third spot. The day culminated with cultures performance by the just play clubs, a living proof that football is definitely a school of life. Previous Post Lord Ve’ehala retains presidency.